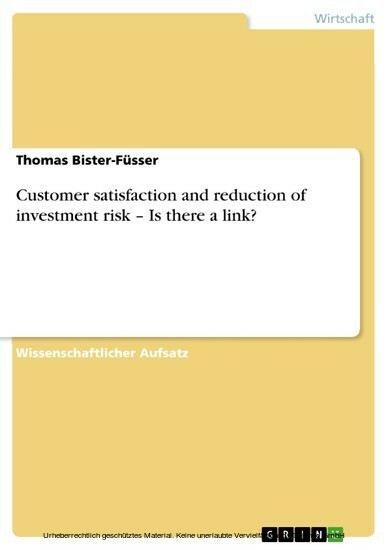 Customer satisfaction and reduction of investment risk - Is there a link? Wissenschaftlicher Aufsatz aus dem Jahr 2011 im Fachbereich BWL - Marketing, Unternehmenskommunikation, CRM, Marktforschung, Social Media, , Sprache: Deutsch, Abstract: It is assumed that investors calculate the risk of their investments. It is further assumed that investors base their investment decision on sound information. Finally, it is assumed that investors diversify the risk of their investments by building investment portfolios. It is the classical economic theory that makes these assumptions. Classical economic theory is inhabited by rational actors and efficient markets and by Equilibria of various kinds that are always established between supply and demand. However, past decades have witnessed an erosion of the rational actor model, mainly because actors did not appear to behave as predicted by classic economic models. Soon after ruptures emerged in the surface of classical theory, theoretical arbitrageurs started to use these ruptures to their own advantage. They introduced ideas of bounded rationality, ideas of actors depending more on situations than on sound reasoning and ideas of a variety of variables influencing actors decision-making process. With respect to investment decisions an entirely new branch of research and theoretical modelling emerged: behavioural economics. Behavioural economics are based on the assumption that differences between predictions of actors' decisions derived from the classical model and actual behaviour are too big, too systematic, and too widespread to be neglected. The new wind in economics and finance stresses situational factors for investment decisions in general and perceptions of risk in particular. Accordingly, risk is no longer an objective characteristic of investment decisions that can be calculated, but risk is a manifold entity that consists of a diverse range of elements depending of actors' perception of situational variables. All these elements have one thing in common, they share a propensity providing risk-relief to actors. Accordingly, anything able to reduce risk in the eyes of (a rational) investors will be added to the portfolio of risk reduction measures. Quite obviously, customer satisfaction can lessen the burden of investment risk in two ways, by either being a matter of personal experience or by providing overall information about investment risks. It is necessary to provide a workable definition of customer satisfaction. Finally, it is necessary to provide the missing link between (perceived) risk, customer satisfaction and investment decisions.